Intel made a series of announcements today as part of its “Architecture Day,” including a new CPU architecture called Sunny Cove, a next-generation integrated graphics solution, and perhaps most interesting, a 3D chip design breakthrough that could dictate how future processors are made. Starting with Sunny Cove, the new architecture is bound for both Xeon server and Core consumer processors. Intel said it designed Sunny Cover to execute more operations in parallel, with new algorithms to reduce latency. “Sunny Cove enables reduced latency and high throughput, as well as offers much greater parallelism that is expected to improve experiences from gaming to media to data-centric applications,” Intel said. Sunny Cove is being built on a 10-nanometer manufacturing process. Intel had run into trouble with 10nm in the form of Cannon Lake, which is still on track to ship in volume at the end of next year. As Intel recently explained, however, its troubles with Cannon Lake “goes back to the early definitions of 10 nanometers in 2014” and the available lithography techniques back then. Dr. Murthy Renduchintala, chief engineering officer at Intel and head of the company’s technology, systems architecture, and client group, had recently pointed out that Intel has separate teams working on 10nm and 7nm chip designs. His message seemed to be that Intel’s early troubles with 10nm don’t apply to 7nm. 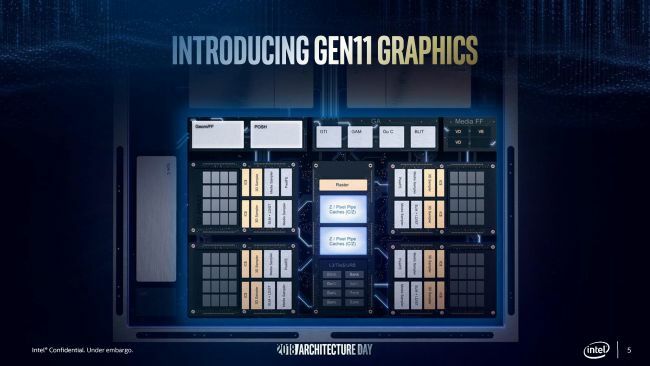 Now with the introduction of Sunny Cove, Intel seems to be indicating it has a firm grasp on 10nm design and (presumably) manufacturing as well. offer better branch prediction accuracy and larger cache allotments. designed to increase game playability,” Intel said. To put that in perspective, Intel is looking at more than doubling the performance of its GT2 graphics variant, so the HD Graphics 630 as an example currently offers a peak 460 GFLOPS. And there’s still potential for larger performance improvements thanks to architectural changes. 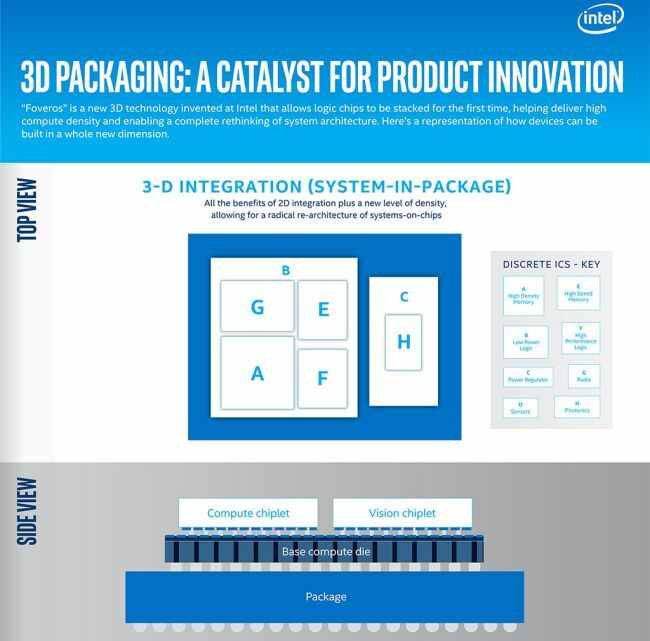 Intel unveiled is the industry’s first 3D stacking of logic chips, which enables logic-on-logic integration for the first time. “The technology provides tremendous flexibility as designers seek to ‘mix and match’ technology IP blocks with various memory and I/O elements in new device form factors. It will allow products to be broken up into smaller ‘chiplets‘, where I/O, SRAM and power delivery circuits can be fabricated in a base die and high-performance logic chiplets are stacked on top,” Intel explains. are most appropriate for the application. interconnectivity,” Intel’s graphics boss Raja Koduri said. This isn’t some theoretical breakthrough that may never see the light of day. 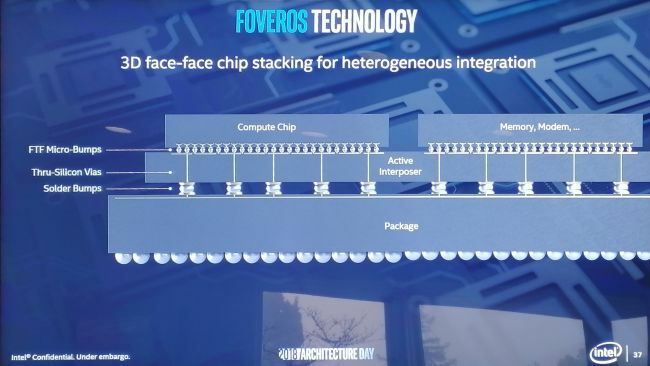 Just the opposite, Intel says it expects to launch a range of products using Foveros in the second half of 2019.